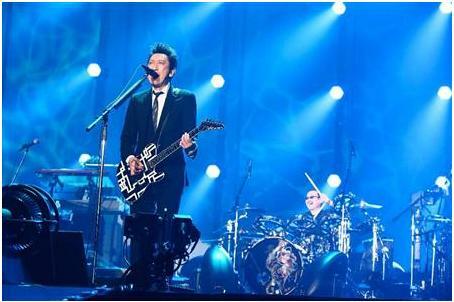 On February 1st, guitarist Hotei Tomoyasu celebrated his 50th birthday with a performance at the Saitama Super Arena. The guitarist enthusiastically performed 27 songs, including his hit songs �Thrill� and �Bambina.�� During the encore, Takahashi Makoto (58), the drummer of rock band Bo�wy, appeared on stage to loud cheers after Hotei introduced him with, �An old friend of mine has rushed here.�� Together, they performed Bo�wy�s hit songs �JUSTY� and �NO.NEW YORK� for the first time in 24 years after Bo�wy broke up in April of 1988. Within the crowd of 12,000 people, reporters spotted Hotei's wife, singer Imai Miki (48), and singer Kikkawa Koji, who was a member of Hotei�s former rock band, COMPLEX.